Stock brokers hang from the front doors of banks, people are killed for being caught cheating on their spouses, and those with repressed feelings are all questioned as to why they are out on the one night of the year where all crime, including murder, is legal in 2023 America. The Purge: Anarchy is story-telling brilliance. Outdoing its predecessor in narrative, character building and spectacle, the sequel reveals the many questions audience members were thinking during The Purge. Such questions include; what happens to people who are caught outside unwillingly on the streets on the scariest ‘holiday’ in America, what happens to the people who cannot afford to protect themselves the same way the rich can, and just how far are good people willing to go for vengeance? Unlike the original Purge, director/writer James DeMonaco decides to do what every good director would have done with a story idea like this, and that is multiple-character narratives that eventually intersect. As the evening is coming to an end and the 12 Hour Purge period begins, the world that DeMonaco created does not seem as far away from our own as we are introduced to an array of different relatable characters. Single-mother Eva (Carmen Ejogo) and her daughter Cali (Zoë Soul) along with her ailing father Rico (John Beasley) are a hard working family. Eva, who works as a waitress at a local diner in the projects of Los Angeles, asks her boss for a raise on the eve of the Sixth Annual Purge that will help with her father’s piling medical bills. Denied, Eva makes her way back home to lock-down her little apartment with very little means of security. Meanwhile, on the other side of town, Shane (Zach Gilford) and Liz (Kiele Sanchez) are having their own problems in their relationship, as well as being following by a gang of anxious masked maniacs who follow them upon learning that their car is stalled on the side of the road due to ‘accidental’ mechanical problems. Both pairs of people, unprepared and scared of participating in the purge, try to survive the night on their own, until they luckily stumble across the Sergeant (Frank Grillo), a man who is justifying his night by killing the man who took his son away from him. Hours before the annual commencement, people flood the streets, searching for last minute ‘protection’ from their partners, their bosses, their disgruntled family members or friends and say goodbye with the words, “stay safe”. They treat the purge as a holiday; some as a patriotic day of cleansing, others as a religious right of passage. Some call it “releasing the beast”, others refer to it as “enjoying the cleanse”, but one thing becomes clear, it reminds us of the crazy times of the year where people are uninterested in your feelings or concerns, a time that could be compared to the holidays, where the ‘dog-eat-dog’ attitude of people becomes ever more apparent. Purging could easily be compared to practically every holiday we experience where people are animals on the road and on the streets, but perfectly behaved citizens in their homes and within the walls of church halls and religious centres and perfectly adequate images in social settings. I believe DeMonaco has crafted a story idea and made a film that is a lot deeper and more complex than people would like to admit. After all, the film is a free-for-all excuse to have people watch just exactly what people are thinking of doing to others that hurt them, without ever getting their hands dirty. Anarchy really goes with the idea of what people would actually do if that little thought in their head of killing their boss, could actually be materialized in the real world, without any consequences. In addition, Anarchy shows the very faint hints of social, racial and economic inequality that is plaguing DeMonaco’s America of the future. Unemployment is less than 5% and poverty is at 1%, and the purge is to thank for this tremendous social statistic, yet, the rich hide and buy their way to an American tradition of cleaning through their heavily-secured houses while the poor help deliver homeless people, hostages found on the street and ‘martyrs’ who offer up their bodies as a bloddy canvas for rich families while their next of kin receive momentous amounts of money. In any direction you put it, the ones who suffer the most are the poor and lower class, and Anarchy spends most of its time showing this obvious and super disturbing truth of an American society whose idea of ‘cleansing’ is no different than the idea Adolf Hitler had in the 1930’s. Cali, a smart and web-savvy young woman, shows her grandfather videos of the revolution against the purge and the conservative, rich-white American leaders who have founded it, aptly referred to as the Founding Fathers. Tapping into the emergency broadcasting system, Carmelo (Michael K. Williams), the leader against the founding fathers and face of the rebellion, shows DeMarco’s intention for future purge narratives, where the focus will more likely be the inner workings of big, corporate America, using the purge as an excuse for the lower-class civilians of exterminating themselves until there is no more lower class. Sadly, Anarchy never really dives deep into the subplot of Carmelo and the revolution against the founding fathers, but if this second entry of what is being described as an “American Tradition” continues to flood screens the next couple of years, I am sure audiences will get their fair share of purging entertainment with a dash of social relevance for years to come. DeMonaco’s violent film concept The Purge was produced for a mere $3 million dollars and nearly made $100 million in the worldwide box office, acting more as a home-invasion thriller-horror with very little to say about the grand film concept. Producer Jason Blum, under his widely successful production banner Blumhouse Productions has had a very quick bout of hits recently, with the original purge, the Paranormal franchise as well as the horror hits Insidious, and was able to round out talents Lena Hedley and Ethan Hawke for the original film. 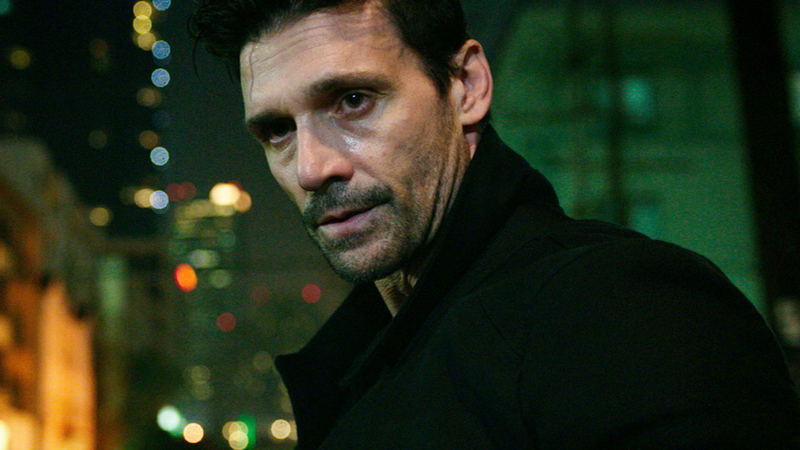 This time, having Frank Grillo headline the second entry with a budget that is triple the original and adding an exuberant amount of an ingredient that was missing from the first film: anarchy, The Purge: Anarchy is a film that does not miss its mark, adding a necessary grit that the original was clearly missing. Grillo, who has been a prevalent character actor for a while, has been making his mark on films, delivering stellar performances in The Grey, Captain America: The Winter Soldier, and my personal favourite and his breakout performance in Gavin O’Connor’s Warrior. Grillo, who never overacts DeMonaco’s character for the sergeant is a rugged escape from the chaos and manic behaviour of the people who are willingly outside purging, hungry for blood, gives audiences a taste of the power and desire of revenge. His approach, as many might see it as the Purge/Punisher, is convincing as he struggles to help people who are in need of it, and his internal struggles of vengeance for his son against a man who killed his son are riveting. Grillo’s sergeant allows audience members to see how the purge effects the poor, working class and rich, and how an average man with a good heart, uses the purge as a means rectifying wrongs when the mistakes and accidents of decent people that are never justified. Grillo is the best supporting star next to a movie concept that steals all the glory on screen. I find it interesting that this weekend, here in Canada, The Purge: Anarchy and Richard Linklater’s cinematic exposé Boyhood are being released on the same weekend. Not that these two films have anything in common, but the two films show a very different take on the cinematic story-telling pendulum. Anarchy is a story-telling film, growing from a concept that is both wildly audacious and sickly twisted, Anarchy is a film that gives audiences the faith in storytelling and what happens when a wild idea is given freedom to run rapid. While Boyhood, a film that gives hardly any new insight to the coming-of-age narrative form, but distinguishes itself as a revolutionary take on cinematic expression and experimental techniques of filming, uses its time-capsule-like filming approach as one of its main allure to audience members and critics. In the case of storytelling, as much as no one would ever admit it, Anarchy takes the crown, offering up a taboo concept of violence, revenge, the justification of killing and underlying religious cleansing techniques as a means of becoming a better person. The film is a metaphor of the state of violence and accessibility of a culture where guns, killing and hurting others is just as acceptable as posting videos of killing, pain and torture. But the real question remains, how far are we, as a society, from actually purging ourselves? Is DeMonaco’s Anarchy better than his original Purge? 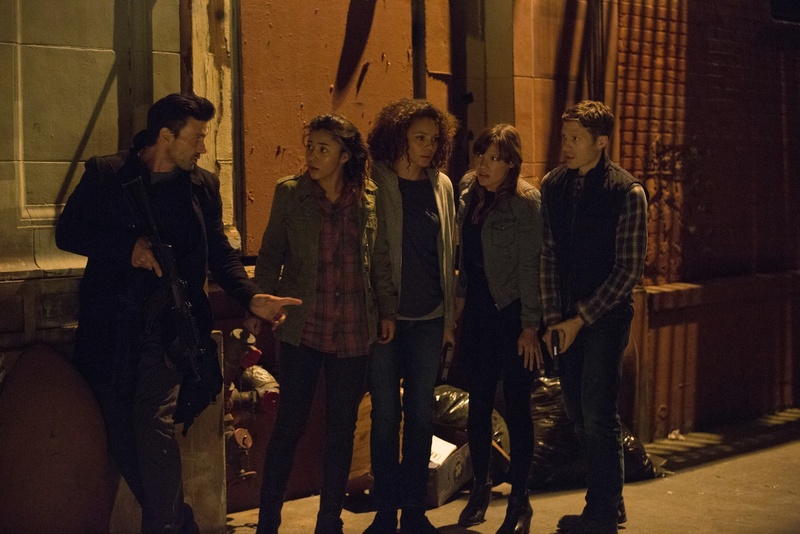 Does Frank Grillo steal the show from Ethan Hawke and Lena Hedley? Does the concept of the film work better as a classic home-invasion slasher film or a cinematic piece of societal reflection? Purge below and leave everything and anything you want in the comments section.